It should be clear at this point that there are several Repubicans openly campaigning for Hillary Clinton. Senator Jeff Flake has been an utter disappointment since he joined the senate. 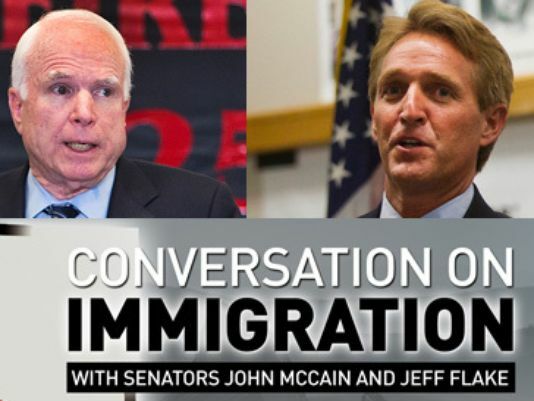 The freshman senator from Arizona joined the pro-amnesty Gang of 8 senators as soon as he was elected. In July he missed the Republican Convention because, as he told reporters, he had to mow his yard. It’s clear that Flake has no regard for the Republican voters. Son Sunday Senator Flake trashed the Republican nominee on “Face the Nation” for several minutes and said he will not support Donald Trump for president. But this same “principled” senator praised Socialist dictator Robert Mugabe. A GOP senator who backs increased trade with the Cuban dictatorship once praised the policies of socialist dictator Robert Mugabe. Jeff Flake of Arizona favors ending the embargo with Cuba but his 1987 BYU master’s thesis raises profound questions about his judgment backing the socialist dictator. Might he be wrong about what will happen with Cuba? “After a visit to the country with exposure to the amount of private enterprise and limited government interference in the economy, as well as recognizing the viable existence of a second party, one would clearly see that Zimbabwe is more on the side of the West,” Flake wrote. Donald Trump responded to the pro-amnesty Gang of 8 member later today. The Republican Party needs strong and committed leaders, not weak people such as @JeffFlake, if it is going to stop illegal immigration.